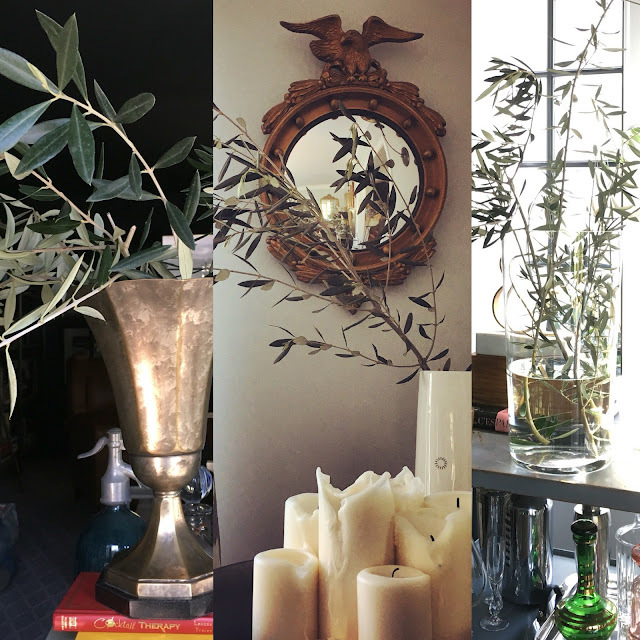 When I bought my home I promised myself I'd have an olive tree. I splurged and got two. Not full maturity, but large enough to not look like border plants. Today, the sun was shining, wind was blowing and if I squinted real hard. Real hard...and looked at the little olive trees I could picture my trip to Italy last year, especially when I visited Tuscany. It was glorious. Oh Italy, how I miss you. Trimming off a few branches and placing them in water was a simple, quick and free way to add some fresh greens indoors. It doesn't always have to be flowers--leafy branches (even bare ones) can make for a great casual arrangement. I love olive trees. The color, the featheriness, the fruit, the wood. Olive trees are overachievers in the tree world. When I was in Mallorca, it was amazing to see all of the olive trees. One road we drove on daily was in the middle of the island, and the hills were covered with them. The wood, the fresh tapas, beautiful!